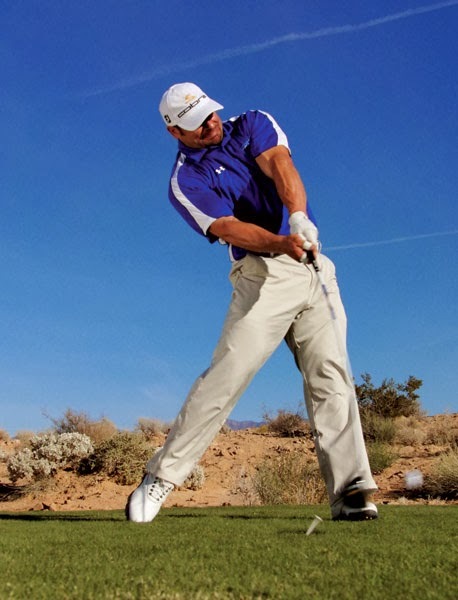 Here's a slow motion video of Jason Zuback - 5 time World Long Drive Champion. Lets have a look at some of his swing characteristics which lead to long drives. 1. The ball is forward in the stance and teed very high. This promotes an upward angle of attack and a higher launch. Both are desirable for maximising distance. Coupled with a low spin rate this will give a player maximum distance for their swing speed. 2. The left heel lifts in the backswing - it helps give a bigger turn, the replanting of the heel during the transition can be a great cue for proper weight shift. 3. Weight Shift in the backswing - he has a great weight shift to the right in the backswing and drives it to the left in the downswing. He doesn't keep the weight to the left like some swing styles. 4. Hands, Arms, Elbows - his hands and arms are very high in the backswing and his right elbow flies. These help with the following, they allow for more arm chopping power, they reduce the moment of inertia on the trunk, allowing faster body speeds, they create a longer backswing arc, which can produce more speed. 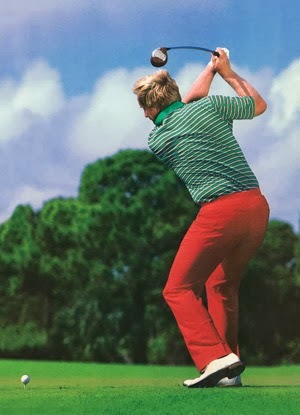 Jack Nicklaus was famous for his flying elbow - look how far he used to hit it! 6. Lower body thrust at impact. It looks like Jason is jumping at impact, given that the legs are a great power source this vertical thrust or jump can add a lot of speed to the club. Many players, especially younger ones, jump like this at impact because their legs are their main power source. It's generally not a good idea to discourage them from jumping as they will lose quite a bit of power. 7. Left Foot Spin at impact - rather then planting his left foot at impact, his left foot spins and is off the ground, planting his left foot would only reduce speed. 8. 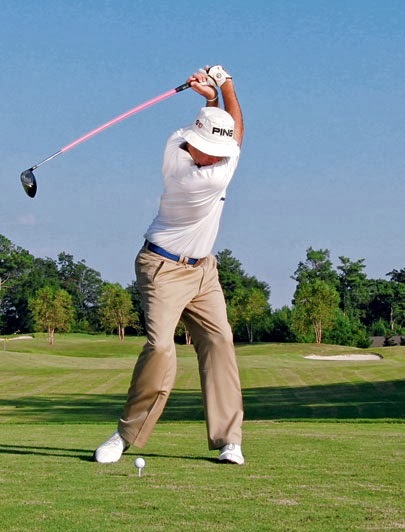 Bent left knee through impact - Rather then having a straight left leg at impact, some long drivers bend their left knee which can help with an upward angle of attack by shallowing out the club. 9. Forearm Rotation - Some long drivers rotate the club aggressively through impact, there seems to be a correlation between the amount of club axial rotation and the amount of ball speed. These swing characteristics are great for adding distance but can lead to a decrease in accuracy. 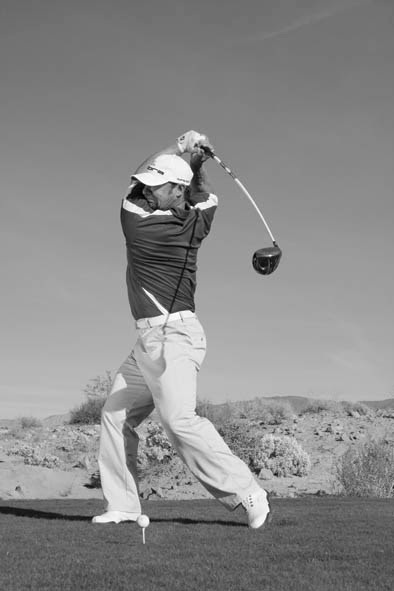 For example the bent left elbow in the backswing can generate more power but can cost accuracy. 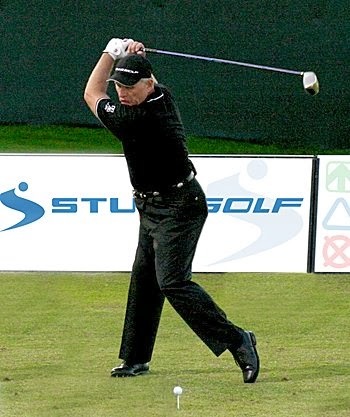 The same for forearm rotation, the more the club is rotating through impact the harder is it to hit straighter. The Long Drive Contestants don't have to worry too much about accuracy whereas a golfer needs to keep the ball in play. Some of these techniques are worth trying if you already have accuracy and would like some more distance. Why not head to the golf course or range and try some out? You never know what might happen!! If you have any comments or questions, please feel free ro send them on.